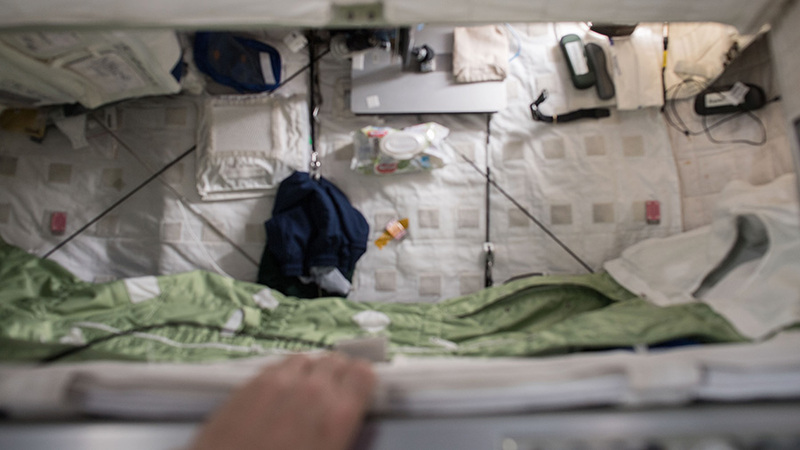 View inside the Crew Quarters where astronauts sleep on the International Space Station. While flying fast-moving jets, we practice the art of recovering from unusual attitudes. We close our eyes, and let the instructor put the jet in an unexpected attitude. Sometimes straight up, sometimes straight down, sometimes upside down, and sometimes anything in-between. The goal is to open our eyes, analyze the situation and make rapid and smooth corrections to power and attitude to effect a speedy recovery to straight and level flight without departing controlled flight, or having to endure high G’s, or experiencing big losses of altitude. Sometimes, when I crawl into my crew quarters on the space station, it is very dark – just like closing our eyes in the jet. And then, as I sleep, my body floats around and changes position. When I awake in total darkness, I have to figure out what attitude I am in relative to my crew quarters and then right myself. “Unusual Attitude Recovery” can be pretty funny. And sometimes, my heart can get pumping as I awake and realize I don’t know what my attitude is. I execute my procedures to figure out what my attitude is, and then correct it. At first, it used to take me a while to realize. But now, it is second nature – and it always brings a smile to my face. Welcome home Scott, been following you and in contact with you mother.Great job and as a past USAF photographer loved your pictures. Hope to see you sometime in Ma. Your much older proud teacher Bill Cahill.